London isn't really as far away from Paris as it seems. Cycling it may take three days for the likes of me, but it is sobering to sit on a train and be back at Waterloo station a little more than two hours later. The most we cycled in a day was the 72 miles from Gournay en Bray, Normandy, to the base of the Eiffel Tower in Paris, but it really didn't seem that far, and my muscles didn't really give the impression it was that far, either. A small team welcomed us in the gardens at the tower's base, and the champagne corks popped. 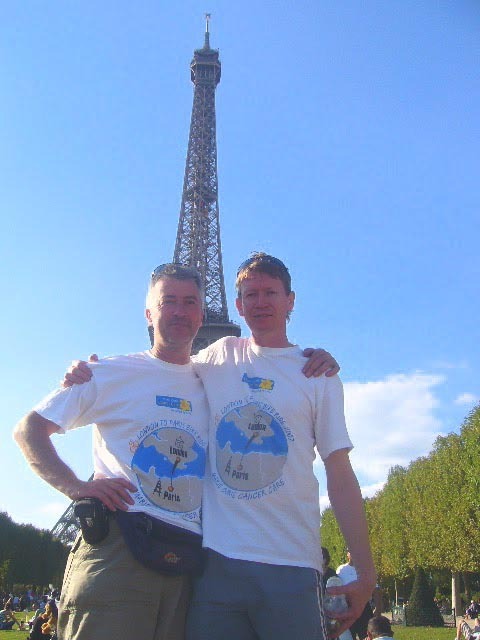 The group has raised more than £54,000 for Marie Curie Cancer Care, a figure that continues to rise. It was fun to do, and no hardship - I'd do it again tomorrow - so thanks again to those of you who have donated. This is my brother Simon (right) and me at the end. He could have done it in half the time. I'll stop going on about it now. Congratulations James, Simon and all your team. You may have gotten back quicker but have fast did the landscape go? The last time I went more than 3 miles on my bike, was a week before giving birth to my daughter who is now 22 and about to graduate from University!